There are over 250 separate estates making Chianti Classico, by definition within a few miles of Ripertoli. We can’t possibly try to tell you about all of them, but we hope this section of our website will introduce you to some of our favourites, tell you how to go about tasting a wider variety, and explain about buying direct from both the best shops and individual estates. 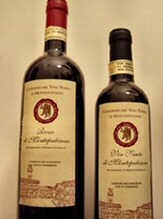 Almost all Chiantis benefit from being opened several hours before drinking. As an experiment, open a bottle one evening, drink half of it, re-cork it, and try it again the next lunchtime. It will almost certainly have improved. Vintages vary considerably, and it’s worth getting to know the good ones. It’s also true that some estates make good value wine in poor-weather years like 2002, because they don’t make their finest wines at all and put their best grapes in their ordinary Chianti. 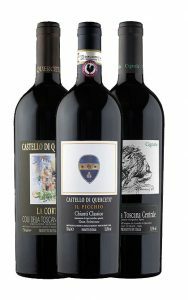 Chianti Classico is made to be drunk young; say 2 – 5 years after the vintage, depending on the year and the maker’s philosophy. A Riserva is made from the best grapes and is designed to be drunk later; say after 4 – 10 years. Most top estates make a “Super Tuscan” wine which does not conform to the Chianti Classico rules but may well be an outstanding wine. The variations come from using non-traditional grapes (e.g. Cabernet Sauvignon, Merlot), or ageing in small French oak barrels (barriques). 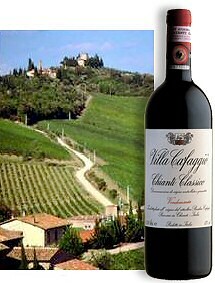 The Chianti region specialises in red wine. While some white wine is made locally, we don’t like it much so we don’t recommend any. The nearest genuine local white wine is Vernaccia di San Gimignano, good luck if you decide to try to find a nice one! Chianti is not cheap. 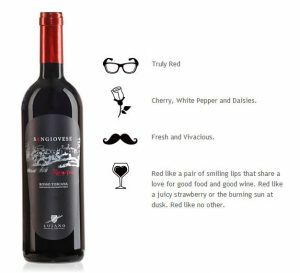 It’s usually a hand-crafted wine made in relatively small quantities, and the prices reflect this. Just south of the Chianti region is the town of Montepulciano, where Vino Nobile is made from a different clone of the Sangiovese grape. Don’t tell our wine-producer friends that we said so, but it’s often better value than Chianti. There is a remarkable institution in Greve, Enoteca Falorni, where you can taste up to 140 different wines. It’s a little antiseptic – you pay for credit on a little card and then use the card to get small samples of as many wines as you wish – but the selection and organisation is thoroughly professional. The website is www.enotecafalorni.it which explains under “Drink” exactly how it works. This is a good place to get your eye in on vintages and individual wine makers. 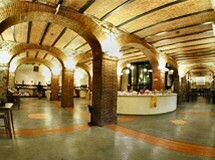 Le Cantine (The Cellars) is very close to the main traffic lights in Greve, about 50 metres north-east of the crossroads. The Bottega del Chianti Classico in the main piazza in Greve is the best central shop with a wide variety of wine from lots of different producers, but they don’t have any tasting facilities . The new Enoteca di Greve www.enotecadigreve.it seems promising – it’s in the piazza on the main road beside the library, just north of the Coop. There are over 50 wines available by the glass, which seems a good start. There are plenty of other wine-selling establishments in Greve itself, including the Enoteca fuori Piazza at the north end of Via Roma, which has a small but high-quality selection and a reasonable traditional restaurant. Our good friend Filippo at the Ristoro di Lamole also has an excellent selection of wine for sale; if you go there to eat, let him know in advance that you are interested in wine purchasing, and (as a Ripertoli guest) you should get a worthwhile discount. Two alternative wine shops are in Panzano. One, on the Chiantigiana main road, has a huge selection of wines from around the world, usually with a few available for tasting by the glass. The other is the Enoteca Baldi, run by our friends Mimmo & Arianna (see the Restaurants page), again with a choice of mainly Tuscan wines, and half a dozen of each colour on sale by the glass. 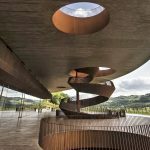 Once you have got your eye in at a general wine shop or two, you might want to visit some individual estates and their “Venditta Diretta” outlets. It’s accepted practice to call on an estate, enquire about “Vendita Diretta”, and taste whatever wines they have on offer – but it’s also considered good manners to buy at least a dozen bottles of wine as a thank-you. The Luiano winery www.luiano.it is owned by a friendly marketing-oriented family who speak excellent English and have a warm but professional set up for visits. The estate is a 15-minute drive away, off the road to San Casciano, and you can be sure of a welcome if you say that you are staying at Ripertoli. Villa Cafaggio (www.villacafaggio.it) is a traditional chianti, and it’s very near Ripertoli – turn left out of the drive towards Panzano and the right turn to San Martino is after about 4 kilometres. The website is very informative. Our friend Sandro Francois, through whose help we found Ripertoli in 1988, owns the Castello di Querceto (www.castellodiquerceto.it), on the road to Figline from Greve; we particularly like his Riservas and Super Tuscans such as La Corte, Il Picchio and Cignale. Other favourites include Castello di Cacchiano, Querciabella, Lamole di Lamole, Vecchie Terre di Montefili, Rampolla, Isole e Olena, Fontodi, Riecine, Castellare, and (for a light lunchtime wine) Vitiano. Most Chianti producers are members of the Black Rooster (Gallo Nero) Consortium; its excellent website is www.chianticlassico.com, through which you can find the websites of dozens of wineries as well as interesting information on how chianti is made and why it is so special.